grapes in the blend are, 80% Cabernet Sauvignon (harvested at 22 brix, t/a 7.5 g/l as tartaric), 15% Petit Verdot (harvested at 22.2 brix, t/a 7.2 g/l as tartaric) and 5% Cabernet Franc (harvested at 19.6 brix, t/a 7.6 g/l as tartaric). The musts were fermented in contact with the skins for a period of 14 days and were vinified using Saccharomyces cerevisiae yeast originally isolated from France's Languedoc terroir. They were made in separate lots between September 23 and October 8, 2014 and subsequently transferred to a combination of French Nevers and American oak in January 2015. Malolactic fermentation was effectuated in oak where the wine evolved for 30 months until July 2017. The wines were blended and bottled in August 2017. 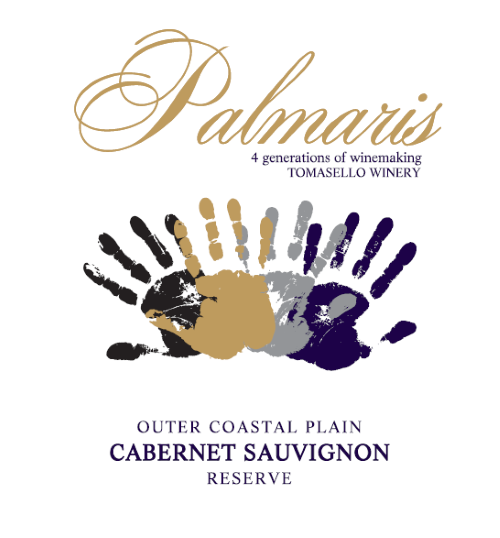 The Palmaris 2014 OCP Cabernet Sauvignon is a full-bodied red that needs aeration to develop its full flavor, so please decant prior to serving. We hope that you will enjoy this fine wine with a fine meal while in the company of good friends.